They take small steps each day over time to get results. They are certain that their intentions are within their own control. They set time frames of by when they will achieve their results. As an organization, I see our future as being the real estate brokerage of choice in Northern Virginia for productive agents and clients. What this means is that our organization partners with you for your success. To achieve the result of being the real estate brokerage of choice we will implement the four steps described above. Understand why you are doing what you are doing? Is it to help a family member, go on a trip, help other people to succeed, build a house or build a school? When you have a, "Why" that is powerful and strong enough, the, "How" will show up. Have a Vision for where you want to go. We all have a choice that we can live our life by default or live our life by design. I suggest that you chose to design your life and when you do so, you will have to have clarity on where you are going. Focus on holding standards; a minimum amount of listing appointments each month in a time frame that is achievable. Focus on conversion. What good is an appointment if you do not get hired? Understand how many closings that you will need to achieve your personal and professional goals. Tie together your appointment goal with your conversion goal to achieve your professional and personal goals. I HIGHLY encourage that if you are producing less than $3.5M in production each year that you to attend Ignite, and enroll in our Productivity Coaching Program. I also suggest that all agents attend BOLD. As a 9 time graduate of BOLD, I have had the opportunity to benefit from the guidance of this curriculum. It has taught me the habits of a top performer. I promise you that it will make a positive impact for you. Hire a coach - all top performers have a coach. Can you name an Olympian, professional athlete, or top businessperson who does not have a coach or mentor? My mission is to open the doorway for others. Sell More Homes in Less Time! 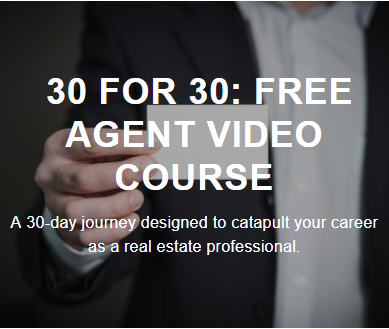 Free Resources for Real Estate Agents to Succeed! Learn to set the foundation that will allow for you to have that very best day - everyday! Nov 2 Winter is Coming!